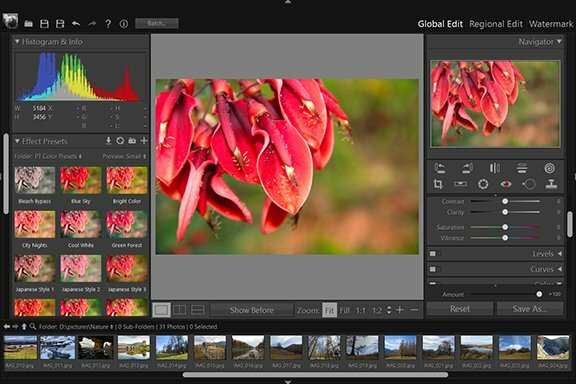 Lens Correction Tool - Global Edit - User Guide of PT Photo Editor - Easily rescue problem photos. Make every shot its best. The Lens Correction tool fixes common lens flaws such as barrel and pincushion distortion, vignetting. You can also use the tool to rotate an image or fix image perspective caused by vertical or horizontal camera tilt. Distortion - Drag to the left to correct barrel distortion and straighten lines that bend away from the center. Drag to the right to correct pincushion distortion and straighten lines that bend toward the center. Vertical - Corrects perspective caused by tilting the camera up or down. Makes vertical lines appear parallel. Horizontal - Corrects perspective caused by angling the camera left or right. Makes horizontal lines appear parallel. Rotate - Rotates the image to correct for camera tilt or to make adjustments after correcting perspective. Scale - Adjusts the image scale up or down. The image pixel dimensions aren’t changed. The main use is to remove blank areas of the image caused by pincushion, rotation, or perspective corrections. Constrain Scale - Constrains the minimum scale to the image area so that gray border pixels are not included in the final photo. Amount: Move the Amount slider to the right (positive values) to lighten the corners of the photo. Move the slider to the left (negative values) to darken the corners of the photo. Range: Drag the Range slider to the right (higher value) to apply the Amount adjustment to a larger area away from the corners. 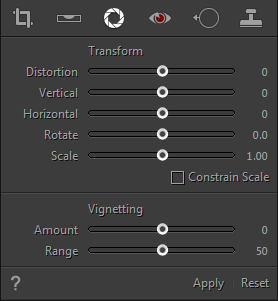 Drag the slider to the left (lower value) to restrict the adjustment to an area closer to the corners. To apply the adjustments, click “Apply” button or in the tool strip. To cancel the adjustments, click “Reset” button.